Bookkeeping is a critical, but time-consuming task...allow us to take it off your hands. We will become your external accounting department—handling all of your bookkeeping needs and freeing you to focus on running your business. Rely on our staff for bill paying, sales deposits, bank statement and credit card reconciliation, and more. With our advanced technology platform, we can manage all of your bookkeeping activity online. 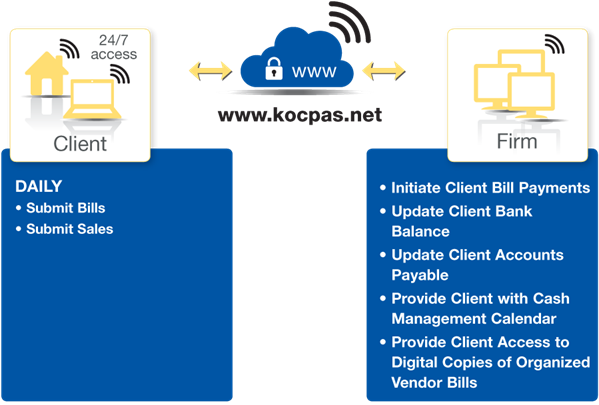 Simply upload your financial information through the secure client portal found on our website and we will handle your daily accounting needs remotely. We take the guess-work out of your financial status with convenient, 24/7 access to your financial information. You will have a quick and accurate picture of all your business activity anytime, anywhere, via a secure internet connection.